Use more fresh sliced veggies in your favorite foods! Make salad toppings, pizza toppings, onion rings, French fries, potato chips, vegetable pasta, coleslaw, zucchini bread. KIDS love julienned vegetables! Great for vegetarian or vegan recipes. Surpahs 5 in 1, Madoline V-Blade slicer will quickly become your favorite and most frequently used kitchen tool! 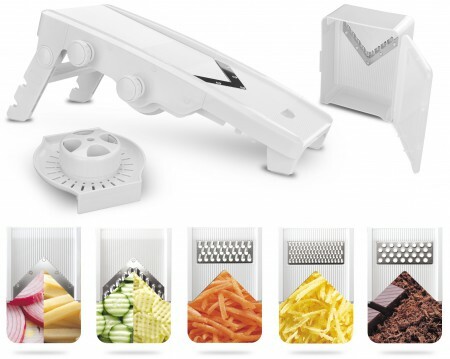 Mandoline slicers take all the work out of slicing, shredding and grating, Use for vegetables, fruits, spices, even chocolates. You’ll eat more vegetables when they’re easier to slice! Make your favorite meals with healthy ingredients! Our patented knob controlled slicer is German engineered and gives you precision control over slicing thickness. No need to swap out slicer blades to get the perfect thickness. Whether you’re slicing paper thin cucumbers or thick-cut fries, you’ll get consistent results with every slice! Your new mandoline slicer requires no set up and very little cleanup. Simply run the slicer under warm water to clean. This 5 in 1 tool will replace that bulky food processor for shredding or grating and slice faster and easier than a sharp kitchen knife. Comes with a Lifetime Warranty.